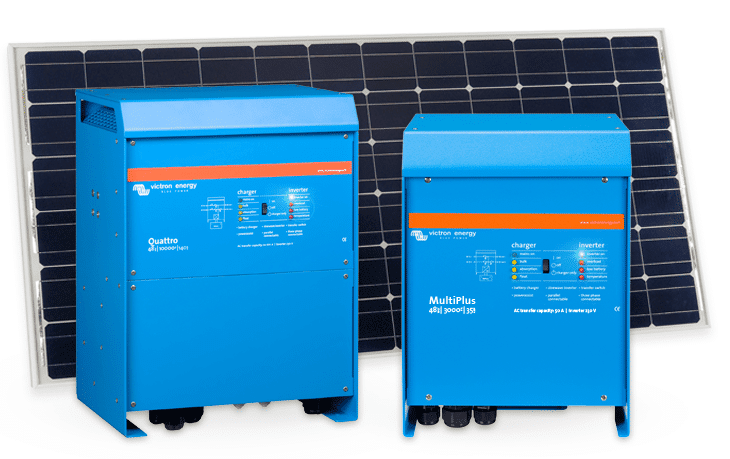 To help determine which settings are the most suitable for different types of solar systems using a Victron Energy Quattro or MultiPlus Inverter/Charger, we have developed a guide: VE.Bus-solar-system-configs (an Excel *.xlsx file). There is also identical content in this PDF guide, for those that don’t have Excel. Q 1: What type of system? A backup system: the (only) goal of the energy stored in the battery is to power the loads during a mains outage. A pure self-consumption system: all energy stored in the battery can be used to power the loads when there is no, or not enough solar power available. A self-consumption system with a battery reserve: a mix of the two types above. For example use the top 30% of the battery to increase the self-use of solar power, whilst keeping the other 70% available for a mains outage. Off-grid site: no mains available. Only a genset, or not even that. Intentional islanding: used in countries with a bad grid. For example with brown outs and spikes. In this case it is preferred to always run in Inverter mode, even when the public grid is available. The well known corresponding setting is AC Ignore in VEConfigure3. Q 2: How to charge the batteries? Always: typically for a backup system: when the power is restored, the customer wants to have the battery recharged as fast as possible, which includes recharging the battery with power from the grid. PV Only: use only power coming from the sun to charge the batteries, except when the lifetime of the battery is at stake. For example, a prolonged shortage due to bad weather. In that case Sustain will use a minimal amount of energy from the grid to keep the batteries in a healthy state. Q 3: Is feed-in allowed? Feed-in is wanted: the meter runs in reverse, or there is some other mechanism in place that lets the customer sell energy back to the utility. Feed-in is no problem, but not wanted either: all energy being fed back is lost, in a sense that it is not being payed for by the utility. But it doesn’t hurt either. Feed-in is absolutely not wanted, not even for a few seconds: to illustrate, there are certain prepaid meters in South-Africa that will disconnect the customer when it detects energy being fed back into the grid. Feed-in is not wanted, because every kWh being fed back is just counted as energy being used and feeding back increases the end-customer’s energy bill instead of decreasing it. Q 4: PV Inverters or MPPT Solar Charge Controllers? If PV Inverters, look for the lines in the Excel sheet that state AC-Coupled. If MPPT Solar Charge controllers, look for the lines in the guide that state DC-Coupled. Having answered the four questions together with the user of the system, look in the guide to see where the decision tree guides you. Hub-4 for a system containing only MPPTs? There is an extensive manual for the Hub-4 system. Set SOC levels: the Hub-1 Assistant can not work with SOC levels, it works on voltage. BatteryLife: prevent cycling your batteries at their low end. Use the grid when available: no switching between grid and inverter, less risk of overload, sinus wave distortions and other issues. See the last question in the Hub-4 FAQ for more details on making a DC-Coupled system with the Hub-4 Assistant. I am convinced this guide will help you find the right approach in designing systems for your customers. It has certainly helped me recently when guiding dealers and distributors, as well as end-customers. We’ll be improving the guide and further simplifying the software setup as we move along, which will help us come closer and closer to our end-goal: setting up a system should be simple and intuitive.